There’s one thing that all moms can agree on: kids grow up way too quickly. Before we know it they are out of diapers, heading to kindergarten and off to college. We can’t stop time, but we can take 10. Turn off your iPhone, turn on your imagination and give your child 10 minutes of your undivided attention. Hot Wheels® is here to get you started. I am sharing our love of all things Hot Wheels over there (including our homemade Halloween Hot Wheels costume), and how those little metal cars changed our lives. I am grateful to Rachel at Mattel for the opportunity to tell our story. I was away for four days at a blogging conference in New York. By the time it was over, I was ready to return home to my family. But what I didn’t realize was how much I wasn’t ready to return to me. What happens when you’ve had the oxygen mask on…and then you take it off? I’m at The Oxygen Mask Project today writing about eggs, bacon, and trying to breathe freely. I almost lost my stuffing in the Hot Wheels suite talking about Howie. – a post to some friends on Friday afternoon. It came up casually in conversation with a new friend I met at the BlogHer conference this week. Jennifer told me that she was looking forward to checking out the Hot Wheels suite since her boys liked cars. “Um…Hot Wheels Suite?” I asked, and turned wide-eyed to my friend (and most awesome roommate ever Kristin). Hot Wheels, or more specifically Mattel, was a big sponsor of the conference. And they had a full suite on the 42nd floor of the hotel to show off their new products. There was no way I was missing that. Friday after lunch, Kristin and I made our way up to the suite. The marketing people showed off their products, including their new app game. Dan, the marketing guy for Mattel, demonstrated how a special Hot Wheels car drives on top of the iPad and “races”. You control the car through the race or you can have a leisurely drive through the city. I could feel my eyes tear up a little. I started to tell the marketing guy a little bit about Howie and his four year long obsession with Hot Wheels. How those cars were our connection to him. And how it was also our autism “red flag”. And then with the iPad – the device that helps him focus and learn and play without frustration…well, the thought of combining the two was just a little much for me. This afternoon, we were getting ready to go to Target to buy school supplies. Lewis was holding my phone for me while I packed up some snacks. “What does this say?”, he asked, pointing to my phone. I had the “Real Moms Play Cars” sign as the background picture on the phone. I told him what it said. An hour later, we found ourselves in the Hot Wheels aisle of Target because…well, we always do. Lewis was trying to convince me that he needed yet another car because…well, he always does. I said no. We had enough. “It’s for you, Mom.” he said. “But I don’t need a car.” I replied. How does one say no to that? To a kid who just one year ago couldn’t speak more than two words at a time? You don’t. We came home with a new car for me and one for everyone else. I think you are the person I met at the Hot Wheels suite at BlogHer12. You showed my friend and me the new iPad game and gave us the demonstration on the remote control car. I told you my two youngest sons were autistic. And you remembered my son liked green. I have to tell you how Hot Wheels changed our lives. It became the vehicle, if you will, for communicating with my sons. It’s how their dad connected with them, how their older brother plays with them. And I had to learn how to play with them too. 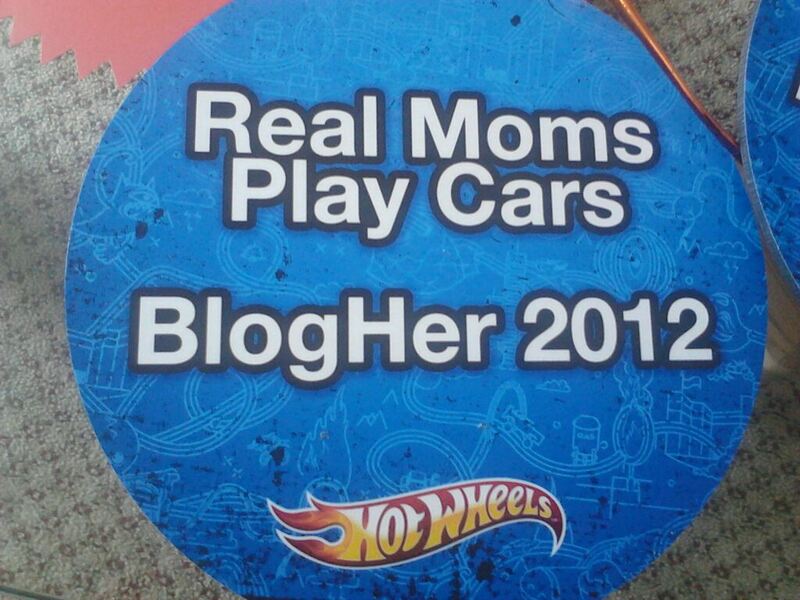 So your “real moms play cars” sign meant so much. It has become my motto. If there’s any way I could get one of those signs , I would appreciate it forever. I get down on the floor. That may not mean much to other moms. Howie chooses a car for me. But playing cars is the one way in to communicating with my boys. Lewis drives his car over to me. Howie says “Wanna race?” and whispers to me that he’ll let Lewis win. It’s how we healed as a family.